There are more than 1 billion keywords searched every month by users around the world. Finding the correct ones for your website is not an easy task. Hundreds of hours must be spent in searching for the right keywords for one ad campaign. Your competitors know best, why not let them do all the hard work by spending time and money on keywords you in turn will use for your ad campaign. 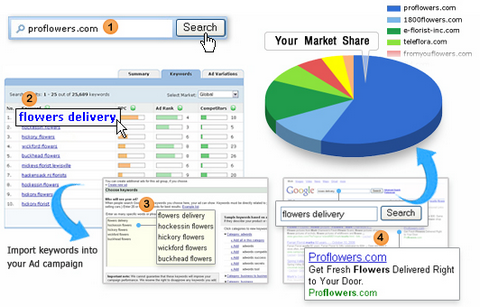 With just a few clicks you can create a large targeted keyword campaign. Only use keywords that are proven to generate sales and save money. Companies with a much larger list of keywords drive more traffic to their sites compared to those who have less. KeywordSpy helps drive traffic from competing sites to your own instantly, resulting in optimum exposure at the least amount of time and costs. mhm.. $85/month if you want to use it. License free? Open Source? It is free to view 10 results. However, you can pay to view all results. I have used several keyword tools and I have to say KeywordSpy just does it best for me. Data is about 99% accurate. I have to say I also like the feel of their site. It’s very cool to the eyes and easy to use so research doesn’t feel boring at all. I would give KeywordSpy my two thumbs up!